While conflict in cyberspace is not new, the legality of hostile cyber activity at a state level remains imperfectly defined. While there is broad agreement among the United States and its allies that cyber warfare would be governed by existing laws of armed conflict, with no need for additional treaties or conventions to regulate hostilities online, this view is not shared by many nations that the United States could potentially face as adversaries. 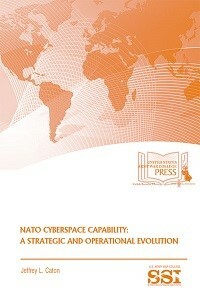 The author illustrates the very distinct set of views on the nature of conflict in cyberspace that pertains to Russia. He provides an important window into Russian thinking and explains how fundamental Russian assumptions on the nature of cyber activity need to be considered when countering, or engaging with, Russian cyber initiatives. This monograph presents a survey of the crucial link between state (national) power and finance from the ancient era through to the present day. Cicero once said that the true sinew of war was “endless streams of money.” His observation remains as accurate today as it was when Rome first began constructing its Empire. Unfortunately, too many historical works leave this crucial underpinning link out of their narratives. Even those that do discuss economic and financial concerns typically miss the fact that the size of a state’s economy often has little to do with its capacity to wield influence on the global stage. Much more crucial, in this regard, is the possession of an administrative system capable of efficiently mobilizing a state’s resources. It was such an administrative apparatus that allowed Britain to punch far above its weight in the international arena for centuries. As a survey, this work is far from comprehensive, but the author hopes it will provide a stepping stone for a much-needed in-depth examination of the topic. The American soldiers who returned home from the war in 1945 were greeted with joy and open arms. They were feted in parades, and celebrated in books, films, and songs. They were the heroes of the war that created modern America—wealthy, technologically-advanced, and sitting astride the world. Later they would come to be known as “the greatest generation”; it is a label that many of them eschew, but it speaks to the way they have been appropriated in American public memory and national identity. The soldiers who returned home from the war in the early-1970s came back to a nation that wanted nothing to do with them. Hostile stares, sometimes worse, greeted them on their arrival. American confusion, anger, and guilt about Vietnam were re-directed to its draftee army. After the war, the U.S. military adopted an all-volunteer force structure. For the services, this choice solved many of the problems of dealing with unpredictable civilian draftees and the sometimes-fickle population from which they were drawn. For the American people, it meant that their husbands, sons, and brothers faced very low odds of being asked to go to war. This shift, however, went far to sever the link between American civilians and the military that represents them, protects them, and does their bidding in the world. The U.S. military recognizes that it will be required to engage in dense urban areas in the near future, whether under combat, stabilization, or disaster response conditions. The military also recognizes that it is not prepared to effectively operate within such complex terrain and populations. Alternative governance structures, which can be ethnic- or religious-based civil society groups or even organized criminal networks, emerge to provide basic services when the state fails to govern effectively. Leaders of these groups maintain control through various means including violence, coercion, and service provision or through tribal, religious, or other cultural ties and structures. 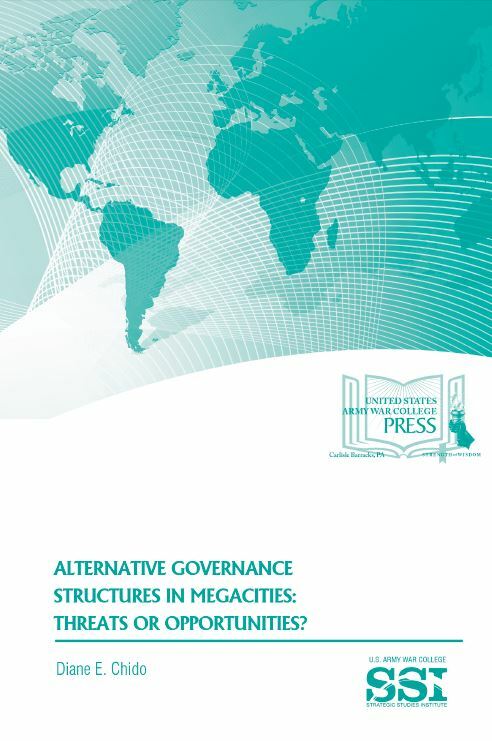 Developing a flexible toolkit of currently available and vetted resources to understand the alternative governance structures existing or emerging in that environment would provide crucial foreknowledge, which will serve as a force multiplier for planning and operating in an urban environment, particularly one as dense as a megacity. 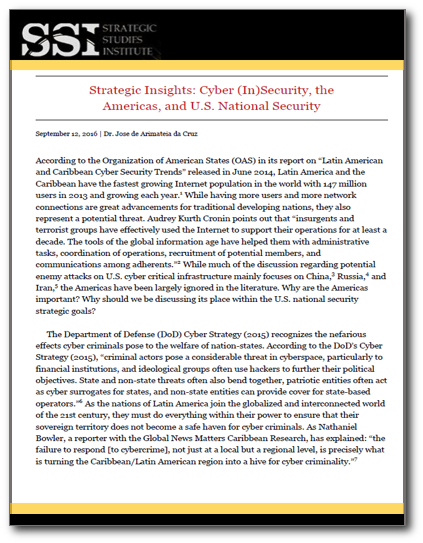 According to the Organization of American States (OAS) in its report on “Latin American and Caribbean Cyber Security Trends” released in June 2014, Latin America and the Caribbean have the fastest growing Internet population in the world with 147 million users in 2013 and growing each year.1 While having more users and more network connections are great advancements for traditional developing nations, they also represent a potential threat. Audrey Kurth Cronin points out that “insurgents and terrorist groups have effectively used the Internet to support their operations for at least a decade. 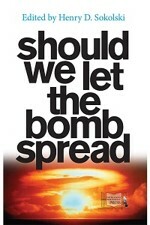 The tools of the global information age have helped them with administrative tasks, coordination of operations, recruitment of potential members, and communications among adherents.”2 While much of the discussion regarding potential enemy attacks on U.S. cyber critical infrastructure mainly focuses on China,3 Russia,4 and Iran,5 the Americas have been largely ignored in the literature. Why are the Americas important? Why should we be discussing its place within the U.S. national security strategic goals? This volume has three parts: the first focuses on cyberspace itself; the second on some of the major forms of malevolence or threats that have become one of its defining characteristics; and the third on possible responses to these threats. One of the most significant features of cyberspace, however, is that it is becoming a risky place for the entire spectrum of users: nation-states, nongovernmental and transnational organizations, commercial enterprises, and individuals. Yet it is a space of opportunities—for benevolent, neutral, and malevolent actors. 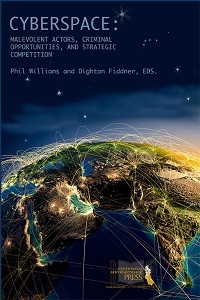 Moreover, the authors identify and assess the challenges and threats to security that can arise in cyberspace because of its unique nature. In the final section, the authors discuss a variety of responses, with some suggesting that the most favored options being pursued by the United States are poorly conceived and ill-suited to the tasks at hand. In the preface to the Army’s Operating Concept, General David Perkins, Commanding General of the U.S. Army Training and Doctrine Command, counsels that as the Army prepares for the future, “We must not be consumed with focusing solely on avoiding risk, but build[ing] leaders and institutions that recognize and leverage opportunities.”1 Indeed, the complex world in which the future force will operate demands that the junior leaders of today—the Millennials—be developed into tomorrow’s future leaders capable of exercising aggressive, independent, and disciplined initiative. Today’s Millennials, however, are coming out of an American society that has become increasingly uneasy about potential danger and progressively intolerant to risk.